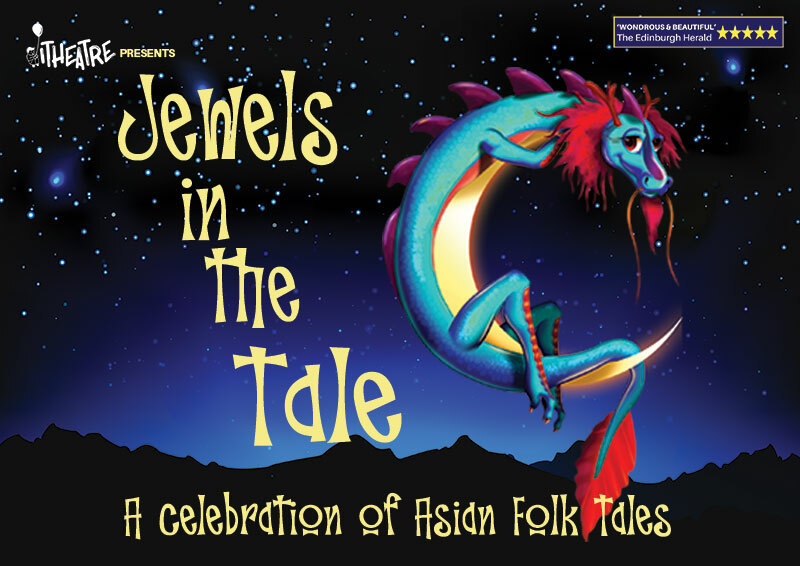 Jewels in the Tale is a marvellous and mischievous production, featuring a very carefully selected collection of stories and folklore from around the region. We searched for suitable tales from all over South East Asia… and now we bring you The Crane’s Gratitude from Japan, Tenali Raman and the Three Thieves from India, and The Four Dragons, from China, amongst others. Each tale is told in a different style, with elements of Japanese Noh, Classical Indian Dance, Chinese opera blended with western styles of broad slapstick fun and energy. With energetic physical theatre, masks and puppetry, fun, colour and music, this is drama that will enthral and entertain both young and old alike. There is lively action and beautifully crafted stories for the younger ones, and multi-layered performance with some interesting morals and questions to challenge and engage older ones too. Through this production we hope you will discover some fascinating insights into Asia’s colourful heritage of folk tales. This is a marvellous opportunity to discover some of this region’s colourful heritage of folk tales in a fun and very accessible form – in the NEWLY RENOVATED Alliance Française Theatre. This is the perfect way to engage and educate your students with a wonderfully fun production! We would like to thank those past contributors to the ‘Dragons’ Series of productions for the creativity that helped to inspire this production : Jonathan Lum, Eleanor Tan, Joni Tham, Feri Susanto, Joyce Teo, Murali. And thanks to Rosemarie Somaiah for giving us that elusive Singapore story! We are offering Educational Groups the EXTRA SPECIAL PRICE OF $24.00 per ticket (20% off the standard ticket price of $30.00), and NO SISTIC fee, plus one complimentary ticket for every 15 paid tickets booked. To make your theatre visit a much more well-rounded and interesting educational experience, we provide a Teachers’ Resource and Stimulus Pack containing information, activities and lesson ideas (upon confirmation of booking), and a free programme and activities booklet for every student when they arrive at the theatre.